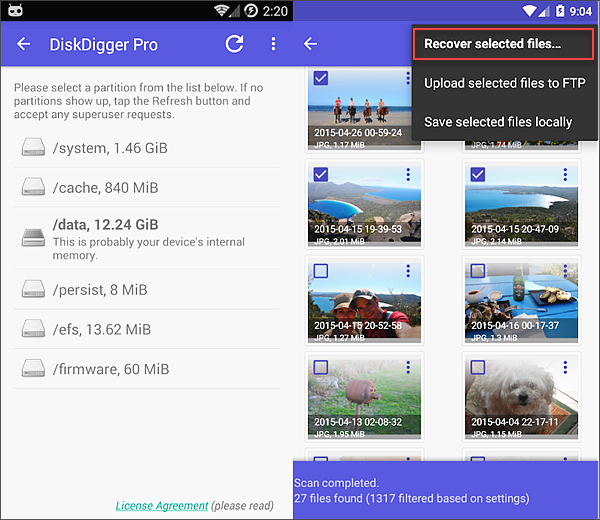 DiskDigger undeletes and helps restore deleted photos from the internal memory or memory card. You may upload recovered files to Dropbox and Google Drive. Or, send these files through email. Save files to another local folder in the Android device. For devices that are not rooted, the software performs limited scanning for the images by searching thumbnails and cache. For rooted devices, the application searches the entire memory for photos and videos. Rooting refers to the process allowing users to gain root access to the Android OS code. One click to root your Android device with the best rooting Apps for Android. 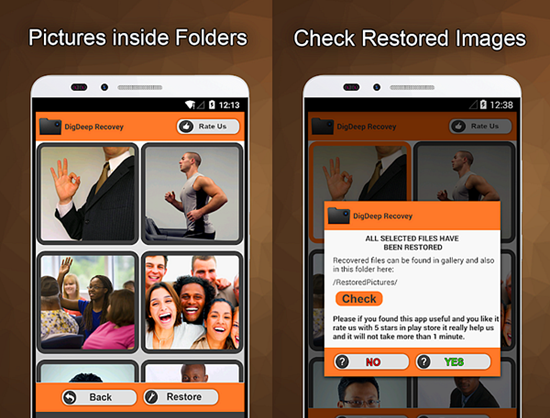 The DigDeep Image photo recovery app searches SD cards as well as internal storage for restoration. This application scans files and folders for the lost images. Once the scan is completed, users will see a new screen that contains folders. Each one has photos from specific locations. Check images for recovery and press the restore button. The dialogue will tell you where to find these images. Users don’t need to root their phones. The terms seem odd. Yet, Dumpster can restore images from Android. It is known as the number one Android recycling bin with more than 20 million downloads. 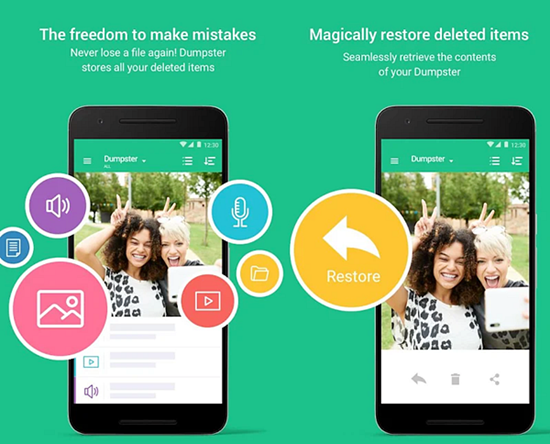 With Dumpster, you can recover apps and other media files within seconds. Recovery and backup of files don’t pose a problem. The locking functionality secures images, videos, and files. It comes available with premium accounts. 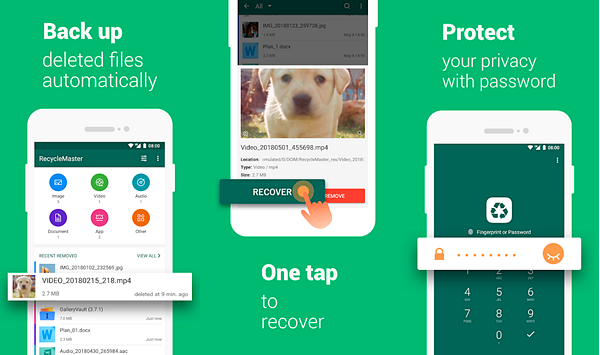 Users can restore deleted photos immediately. Just notify the recycle bin and click the image you want to be undeleted. This will return to your device right away. Dumpster contains secure and flexible cloud storage. The software frees up storage space on your mobile phone. There’s an extra bonus of free customized themes, application-lock capabilities, and free ads. 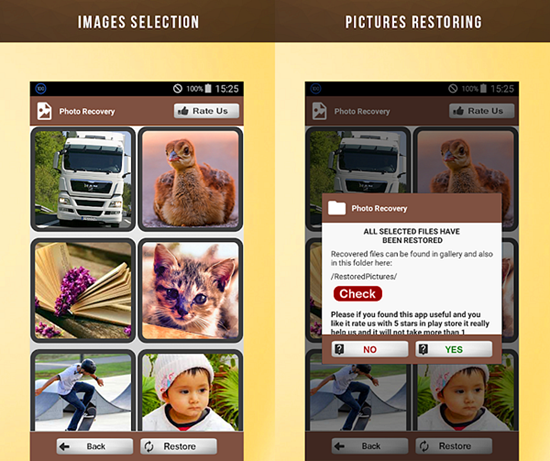 Recycle Master refers to an effective image recovery app. You can install the application to upload the recycle bin in your Android device. It activates the file recovery feature. All your files are backed up in the bin. See to it that you use lock app with a secret password. External viewers can only view the content if they know this password. Auto Clean enables automatic cleaning for useless files. It is possible to schedule cleaning weekly, monthly, or by season. Once you have installed Recycle Master, it can be used as a dumpster for unwanted files (documents and images). You can recover them from this bin. 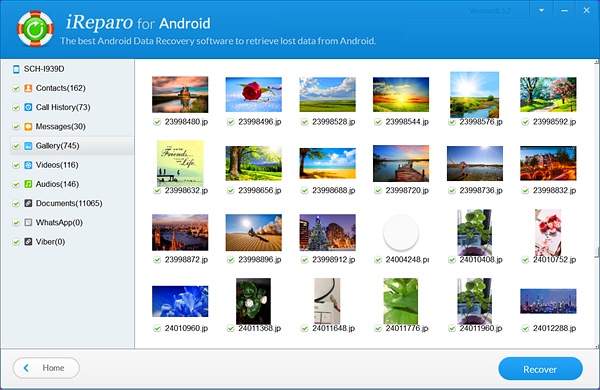 Choose iReparo if you want a good photo recovery software. This application supports popular Android devices such as Google, Samsung, Sony, Huawei, LG, HTC, and Motorola. It is also compatible with the latest Android OS (Version 8.1). To avoid problems, stop using the Android phone after losing data or files. Otherwise, the new data will overwrite any deleted photo or content. It reduces the likelihood of recovery. Choose the category of data or specific file for scanning. Connect the Android phone to your computer. Utilize the USB debugging system and authorize your PC before proceeding to the next step. Scan your android. The final step is to identify the data you want to be retrieved.